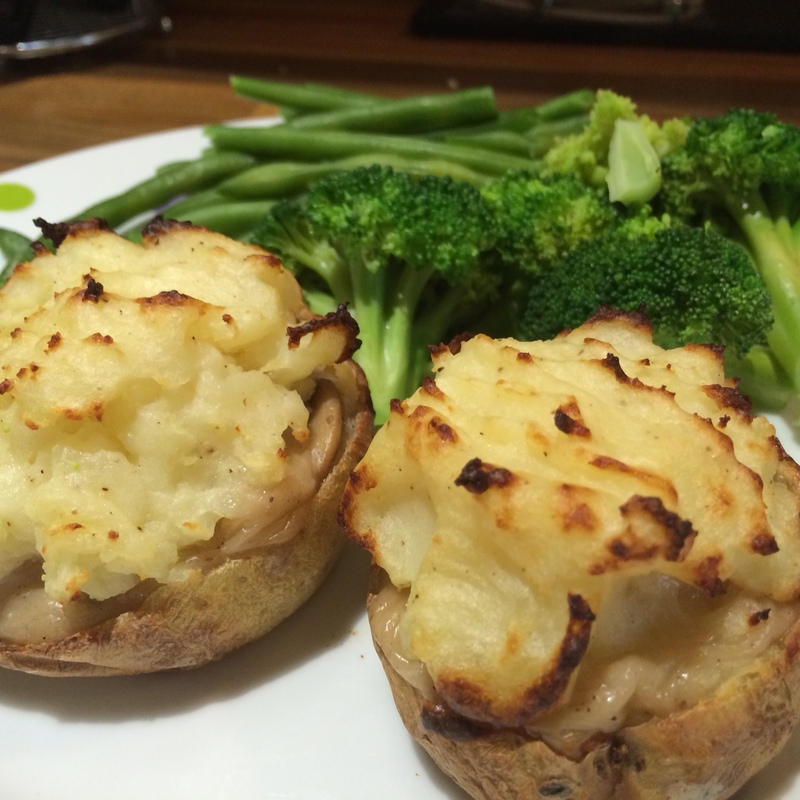 The humble jacket potato is considered a very simple and somewhat overlooked option for lunch or dinner. However, as (the brief British) summer is upon us, the jacket is a simple and quick option that is perfect either hot or cold when you want something easy to eat – leaving you to get back to the sun. They also make great additions to a picnic. Season’s Eatings has collated five of our favourite ways to eat jackets, each of which is delicious and interesting. There’s no need to open a can of baked beans for these recipes. Here is the second of our 5 recipes. Pop both jackets in the microwave for 10 minutes on a medium-high setting. If your chicken breast isn’t cooked, this is the time to do it. We keep ours as larger strips, after all it’s better to have something chunky to bite into. Once cooked in the microwave, the potatoes should be reasonably soft inside. Transfer them whole to the oven for approximately 15 minutes to finish cooking them and allow their skins to become crisp. While in the oven, fry the sliced mushroom in a tablespoon of olive oil over a medium heat. Once softened and beginning to go brown turn the heat down low then add the cooked chicken strips chicken nutmeg and cornflour. Slowly stir in the milk until the sauce has thickened and take off the heat. When cooked, cut the jackets in half; hollow out the soft potato flesh keeping the skins intact. Fill each half skin with the chicken and mushroom mixture. Turn the oven up to 220ºC in preparation for the second baking stage. Add a knob of butter – the larger the knob the better the flavour – to the potato flesh with a pinch of salt and a couple of twists of freshly ground pepper and mash together. Top each potato half with a large spoonful of the mash mixture. Place the now stuffed potato halves on a baking tray and place back in the oven for a further 10-15 minutes until the mashed potato has begun to crisp. Serve with your choice of steamed green veg.